The rest of the article may be of interest to some, but it seems to be a lot of bloviating on his part, IMO.
" GPR never found anything, nothing ! " I don't think Hawass ever believed that she was buried in a temple -- as he says, this is not a practice of the ancient Egyptians and it's not really the practice of the ancient Romans, who generally practiced cremation. The deceased had their own temples but they were not mortuary sites in these cultures. Nor would Octavian want Cleopatra in a temple and worshiped. It's true that one of the Ptolemies had his wife strangled and then built a temple to her, but again, she was not interred there. Plutarch's report that Anthony was cremated seems the most likely and ditto Cleopatra... if she wasn't thrown to the crocodiles. Once a thriving port that dominated the Mediterranean, at least 2000 years ago Pavlopetri was mysteriously lost to the waves. Discovered in 1967, nestled in a natural harbour just off the southern Greek coast, this is the oldest submerged city in the world, created at the dawn of Western civilisation. Its stone foundations, tombs and the remains of its temples have been preserved intact in serene waters, tantalisingly off limits - until now. This film invites you to join the mission of the only archaeological team ever granted permission to dig the site by the Greek authorities. If he doesn't want to be referred to as saying things, speculative things, then he shouldn't say them. What he believes, on the other hand, is a matter beyond my ken. Other than that, I agree the temple as burial site is highly unusual. Huh. Well, okay. I would believe a cenotaph in a repurposed Tomb of Osiris, but I'm highly skeptical about them erecting a temple over any grave of Anthony and Cleopatra. Nor would later rulers have done this. Now... a possibility is that perhaps a later Greco-Egyptian would do so a few years afterward. That's certainly within the realm of possibility. I don't see Tiberius (the successor to Octavian) doing something like this -- the originator would have to be someone who was a close associate of Anthony and/or Cleopatra and possibly a supporter of a revolt or movement to try and get Egypt out of the hands of the Roman empire again. My knowledge of Roman history is scant, so I don't have any likely suspects there. So, it seems to me it is worthwhile to explore this issue of the Taposiris Magna temple and necropolis as a possibility for Cleopatra’s final resting place. If, that is - as Kenemet puts it - her body wasn’t just flung to the crocodiles, which is quite likely what happened. It’s true, as Zahi Hawass says now, that the history of Pharaonic entombment does not include physical linkage with any major temple complex. There were dedicated funerary temples close upon the Pharaoh’s tomb, but those were not akin to, say, the Temple of Amun at Karnak or that of Ptah at Memphis, etc. The Osirian temple at Taposiris Magna was, like those, a major cult center, only of later date…built during the Ptolemaic era, @270 BCE. Then why, for so many years, has the notion of Cleopatra’s tomb at Taposiris Magna been given any credence at all, even by Dr. Hawass in the not-so-distant past? Yes, some artifacts displaying images of Cleopatra and Antony have been found during Dr. Martinez’s excavations, but then Cleopatra had large statues of herself set up inside the Isis chapel there, where she was venerated during her lifetime, so such artifacts aren’t surprising. There are two issues, I’d say, that give one pause in just dismissing the ‘Cleopatra’s tomb’ notion outright: the unique nature of the Ptolemaic dynasty - including the lack of any Ptolemaic royal burial remains or funerary monuments in Egypt - and the (often contradictory) textual information from surviving ancient sources. To avoid mind-numbing walls of text, I’ll address these in subsequent posts. Cleopatra was in Rome in 46 bce with her young son by Julius Caesar, Caesarion. In the quadruple Triumphal parade that Caesar staged for himself there, the Egyptian queen and her son presented themselves formally to the Romans as client rulers quasi-absorbed into Rome and Caesar's family with her Queenly titulary and semi-sovereign power intact...provoking much consternation. She would there have witnessed her sister, Arsinoe, marched in chains before the cheering crowds as a humiliated, defeated queen and obstacle to Caesar, and Rome. Uniquely Arsinoe would be exiled to the east and imprisoned there until being executed in 41 bce by Marc Antony - supposedly at Cleopatra's urging. Among the other captives paraded in chains that day in Caesar's Triumphal parade was the great Gallic warrior Vercingetorix. He would soon after be strangled in his prison cell - a mark of honor towards him from Caesar that he was executed in private. Most conquered rulers were strangled ritually in public. Such was the fate of those mighty people who fell to Rome's conquering war machine. Rome celebrated their brutal humiliation and their ugly death in a fabulous display of gruesome theater. Though, in some cases important prisoners would be chained up inside the Tullianum prison and what was remaining of them paraded out from time to time or else they were just left to rot and starve to death in there, as was the fate of the Numidian warrior Jugurtha. Thus, when all was lost for Cleopatra and Octavian was closing in on her, she knew well what his plan for her was. But it did not happen. Cleopatra died, reportedly by suicide via a deadly snake or poison along with her handmaidens while under custody and awaiting Octavian's arrival, expecting her surrender. Did she triumph over Octavian by denying him his trophy for his Triumph, or did he have her executed swiftly and spun the tale of her suicide for political reasons? (Octavian chose to have Caesarion executed in Alexandria rather than bringing him back to Rome, captive.) Both options are plausible, but may have some flaws. If it weren't Cleopatra, it wouldn't matter that much to history lovers. But it is her, so how do we weigh the options out? Mark Anthony chose death via sword and Cleopatra death by snake bite. Although no Ptolemaic royal burials or funerary monuments have ever been found in Egypt, early in 2017 a candidate was discovered at Paphos, in Cyprus. This discovery is purported to be the only tomb of a king in an impressive, popularly visited area known as “Tombs of Kings”, previously thought of as a misnomer. The rock-cut hypogeum tomb is identified as that of the mysterious Ptolemy Eupator, a boy-king who ruled over Cyprus with his father Ptolemy VI Philomitor. Dying at age 12, he’d been king for 2 years: 152 – 150 BCE. No other Ptolemaic kings’ tombs have been found on Cyprus. 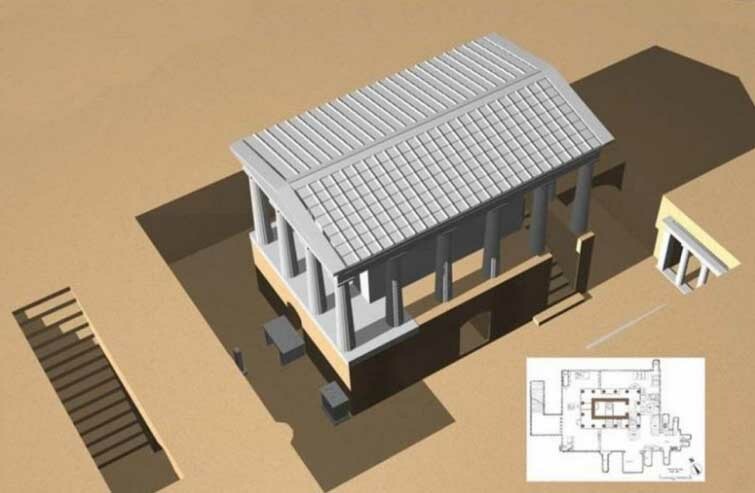 The archaeologists overseeing the excavation have established that the tomb was originally topped with a Doric style temple, signifying the Ptolemaic dynasty and an honor reserved for deified kings (historic sources say Eupator had been so deified.) This Hellenic temple portion atop the tomb would have stood proudly above ground on a solid block pierced by a narrow doorway that led to the burial chamber, whereas the other funerary monuments nearby, also cut into the bedrock and beautifully made, would have sat entirely below ground level and contained a central open-air atrium with Doric columns, like the tombs at Alexandria, access to the burial chambers and shafts was behind the columns. Cyprus was a disputed territory that after the 4th century BCE came mostly under Ptolemy family control, if not directly under the Egyptian crown. Plutarch indicates that Cleopatra’s grand tomb which she built for herself was in Alexandria. It might have looked like Eupator’s, but grander, taller. Antony’s tomb was separate to hers. Both are probably now submerged beneath the Eastern harbor or under city streets. Or maybe Octavian destroyed both of them. Maybe he destroyed all of them. The theory behind the Cleopatra/Antony interment at Taposiris Magna relies on Plutarch being correct: that Octavian allowed them to be buried together. Only not in either of their tombs…in the sanctuary of Osiris, away from town, under the chapel of Isis. So that’s the nut. Yes, the Octogon isn't broadly accepted yet as her tomb. As you know, archaeologists tend to be very careful in attributing tombs of history's grandees and apparently there's not quite enough supporting evidence for Arsinoe yet. This correlates with the Cypriot necropolis at Papha...there is another tomb there that might be that of another Ptolemaic king, and sometimes is claimed to be his. It's known as Tomb #8, and it has a similar solid block structure as seen with Eupator's tomb, unlike the atrium design of the other non-royal tombs there. Yet, unlike Eupator's tomb, not enough evidence exists to support a firm attribution to, if memory serves, the final Ptolemaic king of Cyprus. I don't know the particulars, but that seems to be the case, mirroring the Arsinoe quasi-attribution at the Octagon. I still have more to say on the Cleopatra at Taposiris Magna issue, but if Martinez is correct in her thinking, the placement of the famous couple's remains there was for secretive (political) and protective reasons (Antony's remains would have mattered to Octavian.) The shafts they are looking at as possible candidates are extremely deep and filled with rubble, challenging to excavate. But their surface identification would perhaps have been modest or coded in some way...Octavian would not have wanted any pilgrimages there to honor them or to galvanize political retribution. Octavian would not have wanted any pilgrimages there to honor them or to galvanize political retribution. Here's a short, fine little film from a decade ago made by Zahi Hawass, in which he shows the interior of the extant enclosure walls of the Osirian temple complex at Taposiris Magna and the results of their investigations there, and some of his thinking at the time. Zahi is calm and in fine form here. @ 5.30 min. And this is a CNN report from the same time, showing the dig and featuring a more sanguine Zahi and Dr. Martinez with some of her thinking about why the tomb might be at Taposiris Magna. @ 2:50 min. Absent in both of these presentations is the fact that early in the Roman period the great temple of Osiris which stood inside the enclosure walls we see today was demolished by the Romans and a barracks installed there. Taposiris Magna's strategic position near Alexandra was the quite real justification for such a move, and the huge enclosure walls were tempting defensive fortifications. Some of the richest of Egypts vineyards, olive groves, and other agricultural products lay near the temple and the surrounding area, so having some protection for them and the docks, bays, and canals servicing and supporting them made sense. The chapel of Isis that was found inside the complex by Dr. Martinez was most likely demolished at this time also, and if the tomb of Antony was there, and/or Cleopatra of course, the opportunity to rifle the tombs would have been ripe. On the other hand, Isis was far more popular with the Romans than Osiris, so they might have let it stand. But that doesn't seem likely. It’s difficult to overstate the grandeur of late Ptolemaic Alexandria; see it as the most beautiful, richest, and advanced city of its time. Even late Republican Rome would not have matched it. Ordered and magnificent in its Mediterranean harbor, backed by the huge freshwater Lake Mareotis, which was fed by the Canopic branch of the Nile, the site was a hub of trade with both the Mediterranean ports and with inner Egypt, and then – by way of caravan – over the Red Sea and the empires of the East. The fall of Alexandria was the fall of an epoch…and the jewel in Rome’s crown. Hellenic Egypt would not have been in its precarious position vis-à-vis Rome if not for the Ptolemys’ consistent inbreeding (one of the few Egyptian customs they embraced) that resulted in increasingly childlike mindsets, corrupt policies and spending habits, and – importantly – the waste of its substantial military forces by the appointment of mediocre commanders…which, when faced against the mind and skill of Julius Caesar were simply no match, even though they had the ground advantage and vastly greater numbers of troops. Cleopatra was the exception: a polymath, who spoke nine languages, including Egyptian, who acted and ruled as an Egyptian. The Ptolemys and Alexandrians had generally considered their world adjacent to Egypt, not really of it; Alexandria was primarily Hellenic. She apparently wanted to separate herself from the perceived weakness and incompetence of her immediate forefathers. To that end, she didn’t live in the vast palace compound where the other Ptolemys had each built their individual palaces, on the southern headland of the harbor. She lived on the island of Antirhodos, in the harbor, in her grandfather’s summer palace, which she expanded. Next to it she built a shrine to Isis. Nor did she build her tomb with the other Ptolemys, which all surrounded Alexander’s in a grand square, within the larger palace precincts. 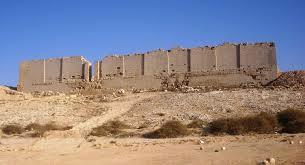 She built hers at the tip of the broad Lochias royal promontory which formed the shield of the Eastern harbor. Beyond the Citadel and gardens, overlooking the Eastern shore toward the delta, she built her tall mausoleum and an opulent temple to Isis. The final events of her life, according to the old histories, took place here at her tomb, and then finally back at her palace on the Antirhodos, where she died. 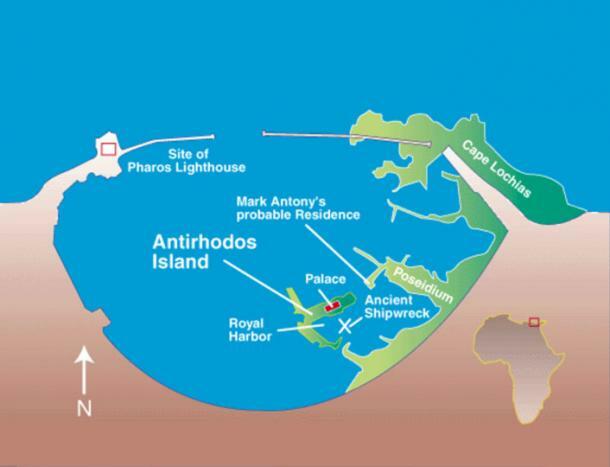 Antony had built a palace for himself on a central promontory in the harbor, which he called the Timaeum. The site of his tomb that he built is unknown. The western part of this map is misleading, and the scale is off. The submerged areas, from subsidence and earthquakes, are in green. Cleopatra's tomb and the Temple of Isis were located at the northeastern tip of the Cape Lochias, which was entirely within but only a small portion of the Royal palace precincts, which covered a third of the entire city, and which contained most of the cities' monumental and civic buildings as well as many palaces. Caesar had a statue of Cleopatra dedicated in the Temple of Venus in Rome. Also a mural of Cleopatra and Caesarion as Venus and Cupid. Caesar declared himself descended from Venus. I doubt this endeared her to the Romans, but imho Octavian was more concerned with Caesarion after the death of Marc Antony. Link didn't take in last post. This one should work.